The busy town of Stevenage in Hertfordshire, supports a range of businesses – from small and innovative start-ups, to high profile companies such as British Aerospace. In between are the shops, leisure facilities, restaurants and commercial enterprises which provide local employment, bolster the town’s economy, and make Stevenage a pleasant and thriving community to live and work in. 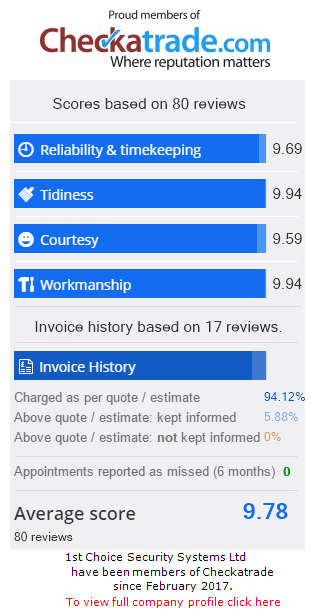 Over the years 1st Choice Security Systems has been a regular visitor to the town, and we know how concerned local business owners are about protecting their commercial premises over weekends, in the evening, and when they want to take a much-earned break. It’s now easier than ever for criminals to know our movements from social media sites such as Facebook, and we’re often asked what is the best security measure they can take. From our experience, we would agree with the advice given by local police forces; a well-maintained intruder alarm system in Stevenage remains an effective deterrent to criminal seeking access to your premises. When asked for an assessment of a business’ security risks we will always consider the location, the neighbourhood, whether the premises have easy access points, the value of the assets held on the premises, and the daily routines of staff including third-part contractors. Once we understand how a business operates, we can recommend a bespoke security system that can be guaranteed to be effective. 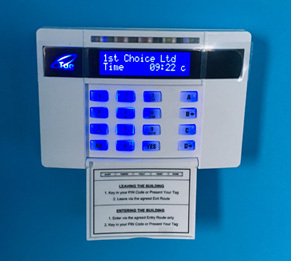 Our commercial security systems in Stevenage will always include the installation of an intruder alarm system for two reasons: first, they are proven to work as a deterrent and, second; insurance companies tend to insist on the provision of a professionally installed alarm. We know that any investment a business makes needs to demonstrate ROI, so we take care to recommend the right alarm system for your premises. The simplest model is referred to as a ‘bells only’ system as it activates on intrusion but response is dependent upon a proactive neighbourhood who will either alert the business owner, or call the police. Unfortunately, the regular occurrence of ‘false alarms’ has meant that we have de-sensitized when it comes to hearing yet another alarm at the end of our street! Fitting a monitored intruder alarm system in Stevenage will mean that activation sends an alert to an Alarm Receiving Centre, who will then forward it on to a designated ‘receiver’ (either you or a trusted colleague, or friend), or to the local police who will respond immediately. For police monitoring you will need a Unique Registration Number for your property which is available only through professional installers. As is the case with all security systems, your intruder alarm is only useful if it is regularly maintained. Many of our business clients have called us to look at legacy systems which came with their premises and we have found many of these to be defunct – so it’s always worth checking whether your alarm system is reliable. We offer a fast and dedicated service which will repair or replace your intruder alarm system if necessary. Don’t take the chance – just call us!